If you don't have someone on the inside, find someone on the inside who's fond of desk ornaments. At a cost of 4 HQ Interface doubles the effectiveness of your accesses when running on HQ runs. Those four will have paid for themselves easily once the runner is able to access agendas! This will also cause the corp to focus more on protecting HQ hence slowing down his/her tempo. 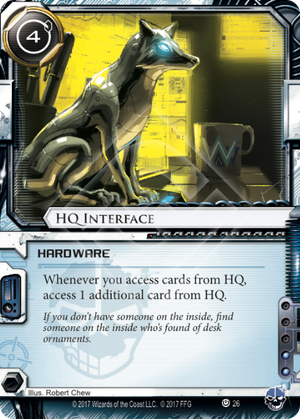 All things in balance, if you are going for HQ card access, this card is worth a look, particularly for Criminals, at two influence cost, maybe in certain cases Shaper & Anarch too.